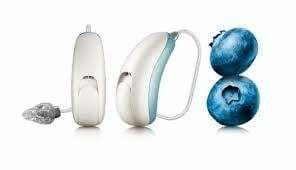 ​​NEW WAY HEARING™ offers the best prices and service on Unitron™ Hearing Aids, Unitron™ Accessories, and Unitron™ Hearing Aid Repair in the area. Unitron™ Celebrates 53 Years in Business! 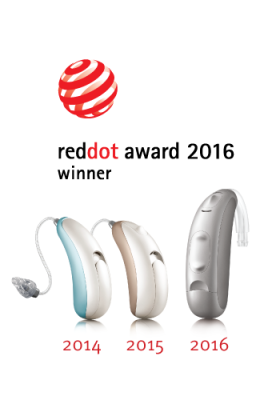 This award winning and inovative manufacturer offers not only the world's smallest rechargeable hearing aids, but also the world's smallest Receiver-In-Canal (RIC) hearing aids! 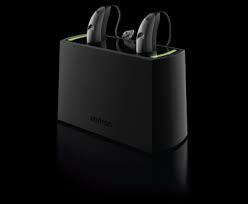 ​​Unitron™ is one of the top leading hearing aid manufacturers in the world. 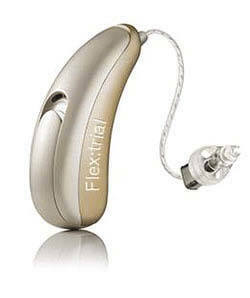 They have set industry standards of excellance in Hearing Aid design and technology. One of the biggest factors for hearing aid problems we face in Florida is moisture getting into the hearing aids. 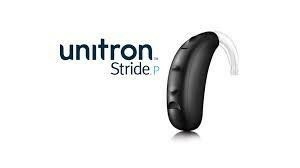 Unitron has some of the very best water resistancy built into thier hearing aids in the industry. Unitron's new sleak and award-winning designs on thier Receiver-In-Canal (RIC) devices also place the microphones in the optimal place for better directional hearing, as well as improved water resistancy. Unitron™ also offers one of the very best Tinnitus Maskers in the hearing aid industry! If you suffer from Tinnitus, Unitron may be just the right fit for you! We offer 100% FREE Hearing Aid Trials! This amazing program is designed to allow a patient to try hearing aids 100% FREE of charge. We are able to change technology levels to ensure the best possible outcome for an individual's lifestyle. 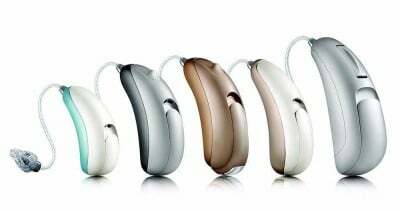 They are offered exclusively in the RIC style of hearing aids, meaning you would not be able to try custom fit devices for this program. The Moxi™ Now™, Fit™, Dura™, and Kiss™ - Utilizing a brand new Tempus processor that is amazingly fast, the new Moxi line offers state-of-the-art sound quality in all listening environments. Very sleek design, water resistant, and easy to use, the new Moxi line of devices has everything! Totally automatic, yet with push button control in the Moxi Fit and Dura to offers users the ability to make changes to different listening situations, control volume and have more comfort no matter where they are. Background noise is less noticeable due the the increased speed of the new processor. Music is more enhanced. Speech sounds more natural and clear. Choose between a wide range of styles, colors, and technology levels to suit your unique requirements. Stride™ - From noisy restaurants to quieter conversations, and everything in between, Stride delivers the natural sound quality that people prefer. Choose between one of four levels, each offering a mix of technologies and features to go perfectly with your lifestyle. So very natural: Speech sounds clearer. Background noise is less distracting. Music sounds pure and rich. Effortless to use: Automatically experience more natural, comfortable listening as you move throughout your day. Easily yours: With a range of in-the-ear and behind-the-ear styles to choose from, there’s a Quantum² that’s just right for you. 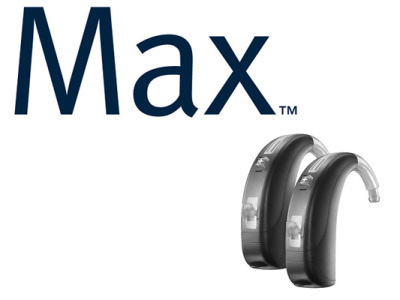 Max™ - Is a Super Power hearing aid designed with determination to give those with severe to profound hearing loss what they need most. Hear more sounds: Max shifts speech sounds away from the areas where your hearing is most damaged and into the range where you can hear them. Max automatically offers better speech understanding without giving up awareness of everyday sounds. Listen without the whistle: Max provides all the power you need without the annoying whistling. Be comfortably aware: Max reduces sudden, loud sounds to a comfortable level, without interrupting awareness. Enjoy the phone again: Automatically hear the caller’s voice clearly in both ears without an accessory. 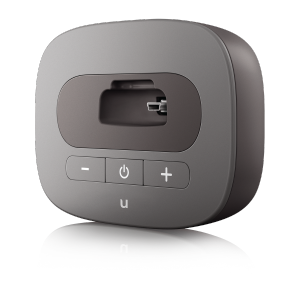 uTV™3 - The accessory wirelessly sends audio from cell phones, televisions, stereos, mp3 players and computers directly to both hearing instruments, through uDirect3 or the NEW uStream bluetooth device. It gives patients control over volume and acts as a charging and storage cradle for uDirect 2. Who is it best for? The patient who likes to be entertained by TV and music, and who has difficulty hearing speech clearly over the phone. uStream - The NEW bluetooth streamer that doesn't have to be worn around the neck! It offers the same kind of functionality as the uDirect3, but is much smaller and clips on a shirt pocket or lapel for ease of use. uDirect™3 - This sleek hands-free accessory provides wired or wireless connectivity to mobile phones, TVs, FM receivers and MP3 players. The optional lapel microphone enables patients to wear the uDirect™ 2 & 3 under a jacket and still enjoy clear phone conversations. Who is it best for? The tech-savvy patient who likes to have further control over their listening environments. uMic™ - Hear it from the source: This personal wireless microphone system lets patients hear their companions more easily in challenging listening environments. Attach uMic™ using the built-in clip or lanyard loop and wirelessly send audio directly to both hearing instruments, through uDirect™3 or uStream™. Who is it best for? The patient who struggles to clearly hear a single sound source in a challenging environment. 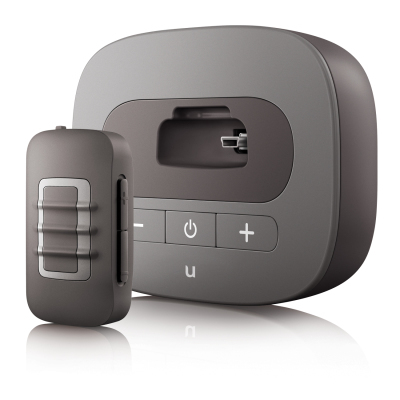 Unitron Remote - Essential features are a click away: This remote is perfect for patients who want discreet, straightforward control over the essential features on their hearing instruments. Who is it best for? The patient who wants an easy-to-use remote. 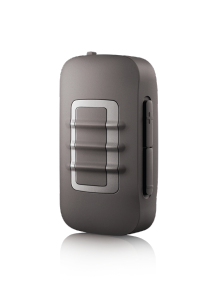 Micro CIC Remote - Discreet and simple control: The pocket-sized micro CIC remote gives patients a choice between magnetically adjusting their volume or switching between programs. Who is it best for? The patient who likes the added convenience of having further control over their CIC hearing aids.